Improve social collaboration among CRM users with personalized updates. Activity Streams are available on the home page or at the module and record level so each user can learn and act on the most relevant information. Sugar's Activity Streams allows users to view a list of activities performed on records, create, preview, comment on posts and more. 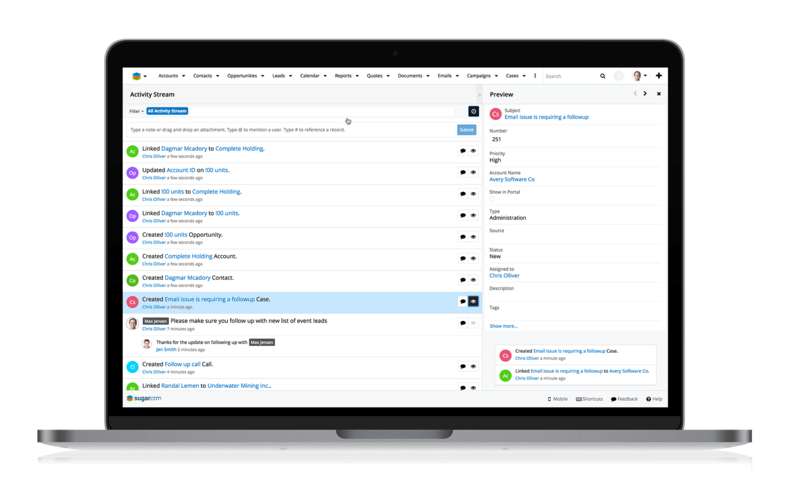 Users can easily track the most recent updates across their entire organization via the record and user posts on each activity stream. Activity Streams can be accessed via dashboards, module list and record views, as well as the Sugar Intelligence Panel. Leverage Activity Streams to view a list of activities performed in Sugar, track updates, as well as post messages to other users in your organization.